In industry circles, musicians from Kentucky are known to possess an enviable pedigree -- a lineage as prized as the bloodline of any bluegrass-raised Thoroughbred. With native sons and daughters like Naomi and Wynonna Judd, Loretta Lynn, the Everly Brothers, Joan Osborne, and Merle Travis, it's no wonder that the state is most often associated with folk, country, and bluegrass music. But Kentucky's contribution to American music is much broader: It's the rich and resonant cello of Ben Sollee, the velvet crooning of jazz great Helen Humes, and the famed vibraphone of Lionel Hampton. It's exemplified by hip-hop artists like the Nappy Roots and indie folk rockers like the Watson Twins. It goes beyond the hallowed mandolin of Bill Monroe and banjo of the Osborne Brothers to encompass the genres of blues, jazz, rock, gospel, and hip-hop. 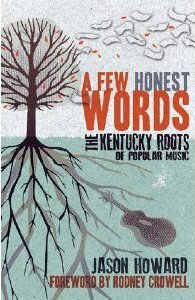 A Few Honest Words explores how Kentucky's landscape, culture, and traditions have influenced notable contemporary musicians. Featuring intimate interviews with household names (Naomi Judd, Joan Osborne, and Dwight Yoakam), emerging artists, and local musicians, author Jason Howard's rich and detailed profiles reveal the importance of the state and the Appalachian region to the creation and performance of music in America.